The noble courtesan is a very common incarnation of downtrodden yet elevated womanhood of the sort I discussed in connection with the film Amar Prem. Rekha's Umrao Jaan is a canonical example of this kind of character, but a decade earlier there was Pakeezah. Pakeezah means "pure" or "chaste," and thus the film's very title evokes the concept of unsullied womanhood despite the most debasing circumstances. Shahabuddin (Ashok Kumar) marries Nargis, a courtesan he loves, in an attempt to save her from the tawaif's life. When his family rejects her, though, she runs off and dies in a cemetery, but not before giving birth to a daughter. The infant is taken by Nargis's sister and also raised in a brothel, growing up to become the famous tawaif Saheb Jaan. When Shahabuddin learns many years later that he has a daughter, he tries to save her too, but her aunt - not wanting to lose such a lucrative member of her household - ships her off to another brothel, to become the exclusive entertainment of an aging nawab. On the rail journey to her new home, the sleeping Saheb is spotted by a mysterious traveler (Raj Kumar) who leaves her a tender note. She clutches the note close to her heart, and harbors a romantic fantasy that the traveler will come for her. When circumstances finally do reunite them, he commits himself to saving her, and Saheb must decide whether she wants to be saved. 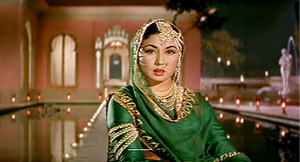 Some things about Pakeezah are very, very beautiful. Some of the shots are just lovely - a sky full of spectacular color, a sweeping landscape, Meena Kumari languishing with her hair floating in a fountain. And its soundtrack sparkles, both the beautiful songs and Meena's sensuous mujras. (I never tire of well-done courtesan songs.) The film is excessively romantic, but this does not detract; rather, it contributes to a sense of otherworldliness that the colorful sets and languid, dreamy tone that the film creates. All of the positives notwithstanding, the story is a little bit frustrating. Saheb Jaan seems to be the anti-Umrao Jaan; as much as Umrao was determined to get out of the tawaif's life, Saheb never really believes herself worthy of anything else. The result is that overarching tone of the film is depressing and hopeless. Saheb never does anything to help herself, and she never develops any inner strength - she isn't saved except when men save her. She has a famous dance on glass, but even this comes across as self-flagellation and punishment, not a display of strength and resolve (as was Hema Malini's dance on glass in Sholay). Saheb Jaan is a character made up of sadness and poor self-esteem, and Pakeezah offers her no arc away from that depressing place.